Second Chances. If we're honest, they're not only something we want. They're something we need . . . most every day. A fresh start. A do-over. A chance to learn from our mistakes and seize the opportunities we missed in the past. There's something intrinsically beautiful and redemptive about seeing that theme come to life on the pages of a compelling romance, isn't there? 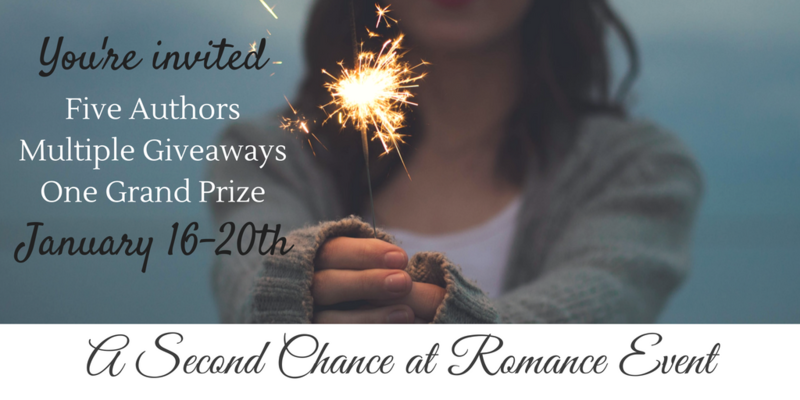 With the start of a brand new year, we can't think of a better time to celebrate that theme than a sale and giveaway of some of our favorite second chance romances. Sales, Gift Cards, and Giveaways! Each day, Jan 16-20th, one author will be highlighting a clean romance we've put on sale for you this week. Be sure to visit each author's website and Facebook page to catch every deal, see what each author's giving away, and enter the grand giveaway of five signed paperbacks! Day 1: Melanie Snitker - Join her at https://facebook.com/melaniedsnitker Day 2: Stacy Clafin - Join her at https://facebook.com/stacy.claflin.author Day 3: Crystal Walton - Join her at https://facebook.com/crystalwaltonwrites Day 4: Kris Noorman - Join her at https://facebook.com/bykristanoorman Day 5: Sarah Monzon - Join her at https://facebook.com/sarahmonzonwrites Don't miss out on the giveaways each author will be offering. 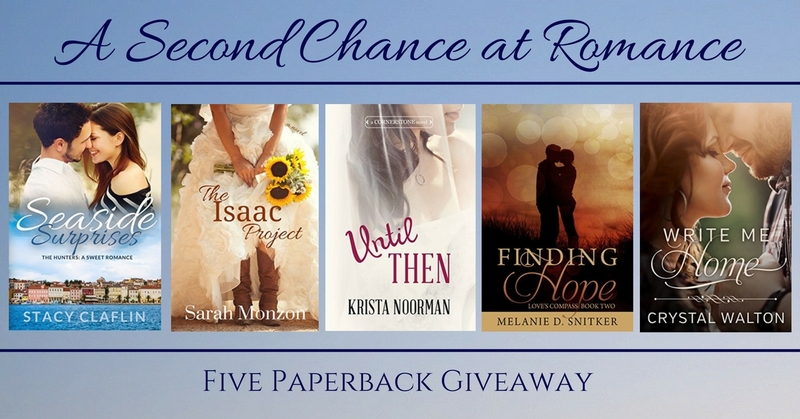 And enter the grand giveaway below for your chance to take home five signed paperbacks! Buy e-book here for only $0.99! ​Becky Sawyer’s life unravels in a single day. Not only does she catch her boyfriend, the man she hoped to marry, lip-locked with another woman, she also receives the gut-wrenching news that her grandfather, the man who raised her, is dying. His last wish? To see her happily married. Heartbroken, Becky seeks inspiration in the pages of the Holy Scriptures. And finds it in the story of Isaac and Rebekah. If love couldn't keep his parents together, Luke Masterson wonders what will make a marriage last. He decides to steer clear of all women—especially crazy ones like Becky Sawyer, who employs a friend to find her a husband. But when he feels the dogged promptings of the Holy Spirit to move across the country and marry a complete stranger, it seems love has little to do with it anyway. With commitment their only foundation, and love constantly thwarted, can an arranged marriage find happiness in the twenty-first century? I'm so excited to have you visit my little corner of the web and enter this amazing giveaway! The Issac Project is a contemporary story inspired by the Biblical account of Rebekah and Isaac. This, my debut book, was loads of fun to write and I have been blown away by the response it has gotten. My mind has been perculating on writing more books like this--contemporary Biblical retellings. What Biblical story would YOU be interested in reading an "inspired by" account of? Answer in the comments for your chance to win a $5 Amazon gift card! By the way, I LOVE that pic on your home page! *wink wink. OK, I've always wanted to read a retelling of Daniel & the Lion's Den?!! No? I've loved that story forever and when I taught Sunday School, that was my favorite story to talk about with the kids. I've always enjoyed the story of Ruth and Boaz.